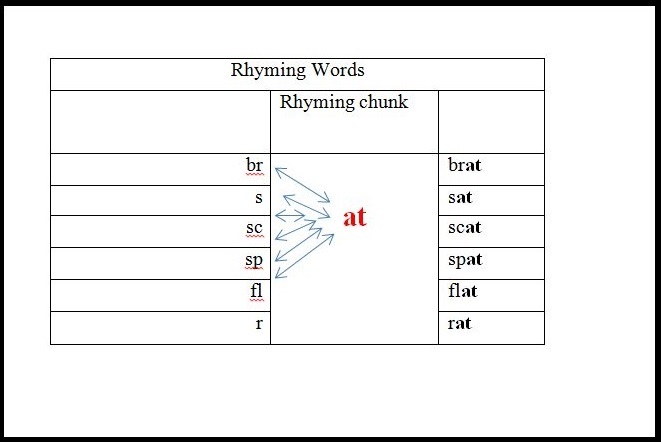 We teach students rhyming words to help them develop phonemic awareness which leads to better reading and writing (spelling) success. 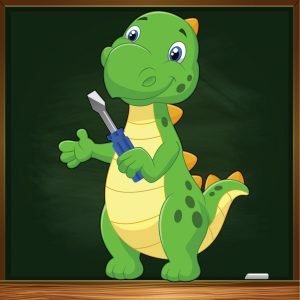 When a student learns to manipulate words through rhyming and rhyming word games, he has acquired an important skill to break words into smaller parts and to recognize smaller parts in words. Thus, rhyming teaches the patterns and structures in both spoken and written words. 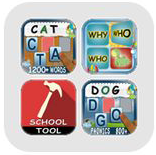 School Tool Rhyming Words iOS application was designed following Communicative Language Teaching (CLT) Approach. 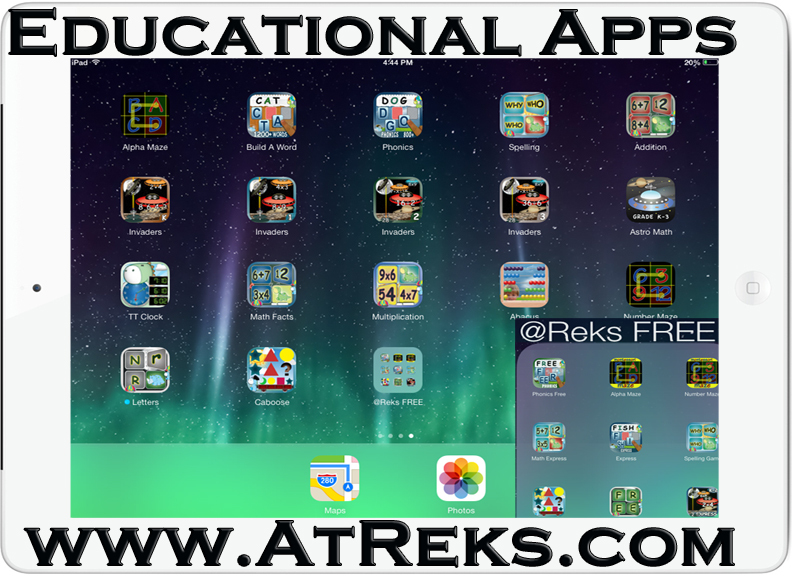 Namely, School Tool Rhyming Words app was planned to be a part of Presentation, Practice and Production language teaching methodology. Presentation – Practice – Production, or PPP, is a method for teaching structures (e.g. 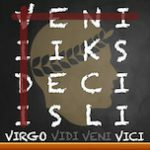 grammar or vocabulary). As its name suggests, PPP is divided into three phases, moving from tight teacher control towards greater learner freedom. Practically the method relies on the progression from presentation, through controlled practice, to free production. 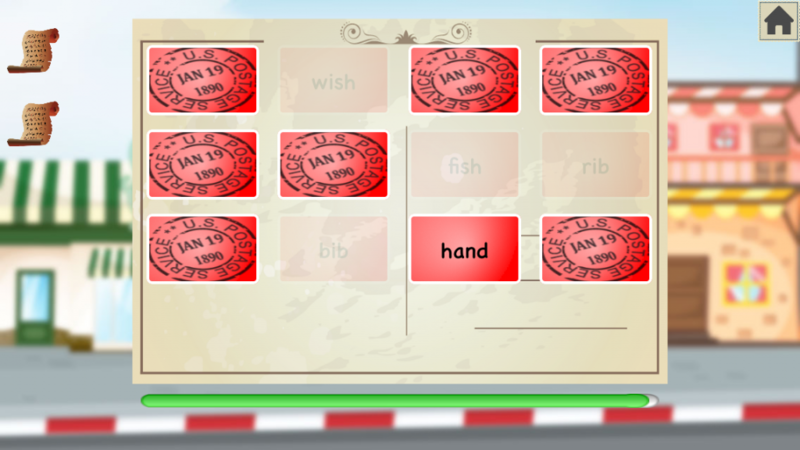 Having this in mind School Tool Rhyming Words was given three main parts Learn, Practice and Quiz. 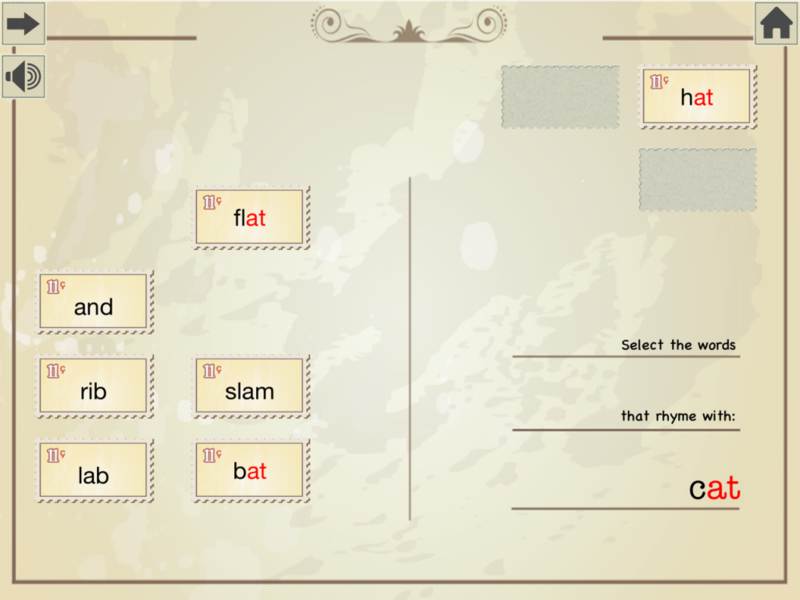 Learn Mode in School Tool Rhyming Words can easily be transformed into a presentation phase. To achieve this, choose 0 for Number Redundant Non-Rhyming Words in SETTINGS. Then, swipe Color-Coded Letters button in SETTINGS to ON. During the practice phase, students practice saying or writing the language structure correctly. Practice activities are controlled and usually include drills, multiple-choice exercises, gap-and-cue exercises, transformations etc. In this phase, the teacher’s role is to direct the activities, to provide positive feedback to students, correct mistakes and model the correct forms. Learn and Practice Modes in School Tool Rhyming Words represent a range of highly controlled to less controlled activities. Learn Mode can be transformed into a controlled activity by adding redundant non-rhyming words as distractors. It is a rather controlled drill since tapping the incorrect word does not lead to penalty, bad score or activity pause. If a student taps an incorrect word, only the word’s narration is heard. Student is encouraged to move to the next word to try again. By turning Color-Coded Letter button to OFF, the activity becomes more challenging by a notch. And finally, to avoid mere random tapping on the screen, Completion Method in SETTINGS can be changed from Tap to Drag&Drop. Now a student has to drag the word and drop it into a slot. Practice Mode consists of a number of games. 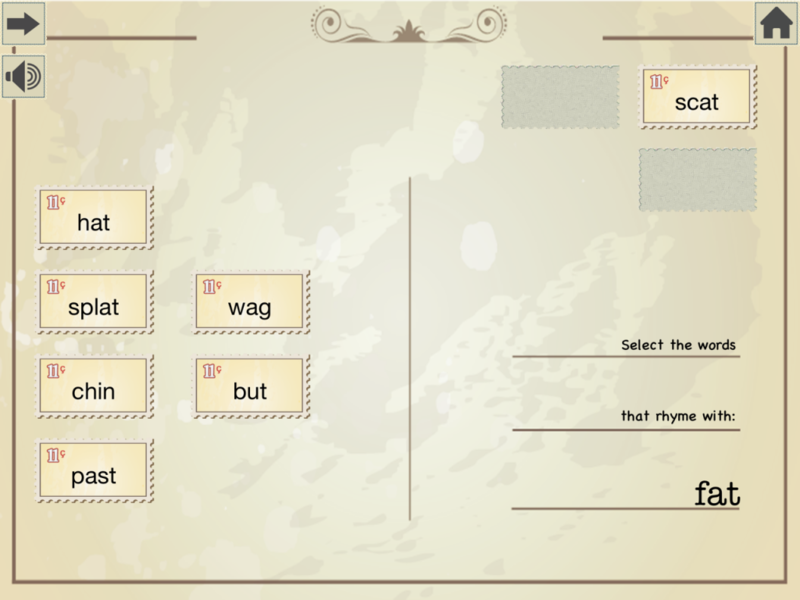 The gameplay of each game includes the use of rhyming words. 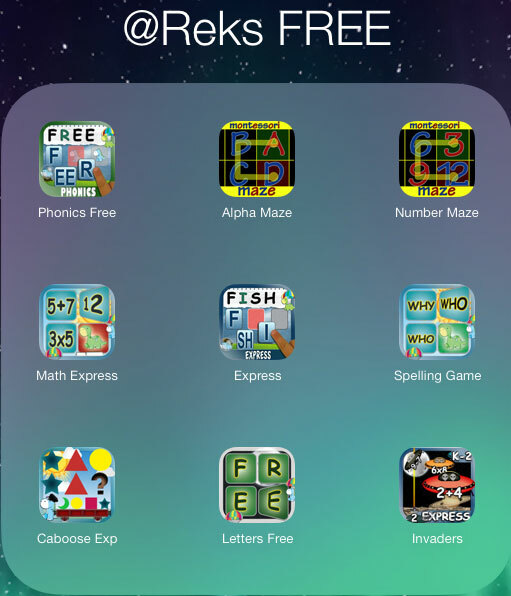 These games are much less controlled than the activity in Learn Mode. 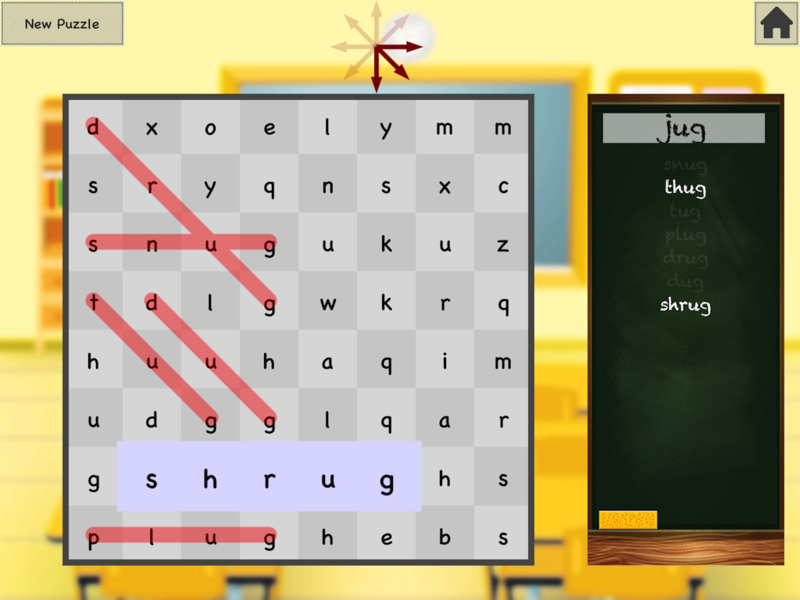 Upon guessing an incorrect rhyming word, or spelling in Word Search, characters in the game indicate lack of success which may lead to pausing the game and inviting the student to try again. a) Card Matching game is a classic memory game that expects students to match only words that rhyme. – See-through helper tool (0, 1, 2, 3). This is like an x-ray feature that lets you see the words through the cards. b) Bridge Crossing game reveals dinosaurs in a long train. Each dinosaur carries a word. Only one word is on the bridge. 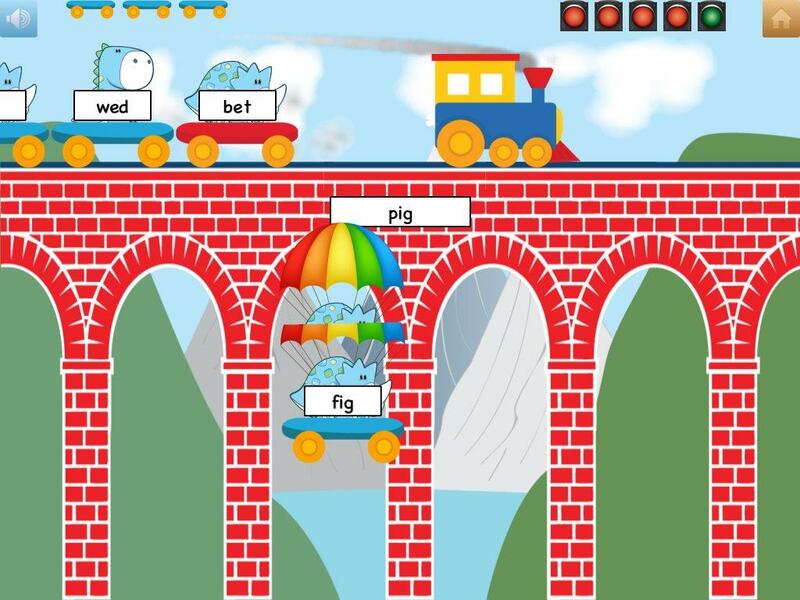 A student is expected to tap the word on the train that rhymes with the one on the bridge. 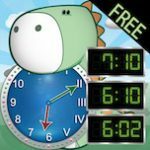 If the correct word is tapped, the dinosaur carrying the appropriate rhyming word has his parachute opened and safely lands. 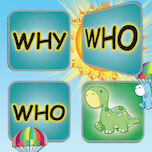 If the incorrect word is tapped, the dinosaur disappears into the clouds with a sad “No!”. – Extra Wagon Frequency (Low, Medium, and High). Here you choose how frequently you want to see the distractors, that is, non-rhyming words. – Required Correct Answers (1, 2, 3, 4, 5). Choose after how many correctly tapped rhyming words you wish the game to stop. c) River Crossing game is a fun game in which a student is trying to help an animal (elephant, rhino, pig, monkey…) cross the river by jumping from one boat to another. 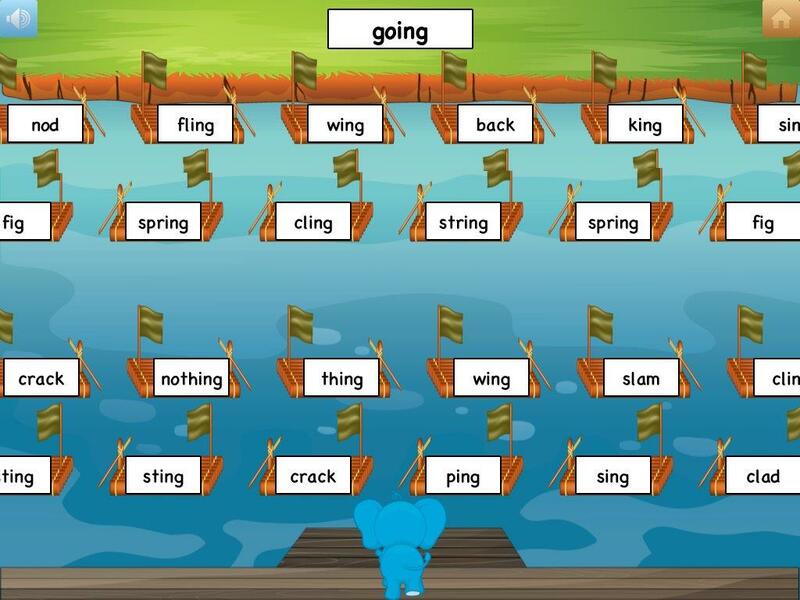 The animal has to jump onto the raft (or boat) with the word that rhymes with the one offered on the top of the screen. The animal is enabled to jump by a gentle tap on its back. The rafts with rhyming and non-rhyming words are moving all the time from left to right, and from right to left. The trick is to tap the animal at the moment the raft with the correct rhyming word is just in front of the animal. – Raft Speed (Low, Medium, and High). Choose how fast you want the rafts to move from left to right / right to left. – Extra Rafts Frequency (Low, Medium, and High). Choose how frequently you wish to see distractors, that is, rafts with non-rhyming words on them. 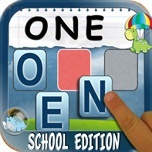 d) Word Search game is offered only in iPad app due to the sizing issues. 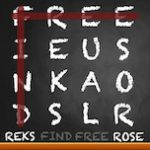 In this classic word search game in which a student attempts to cross out letters that make a certain word (spelling). 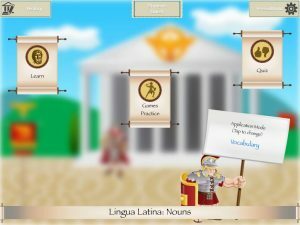 A list of rhyming words is given before each game. A student looks for each word in a square filled with letters. – Allowed Directions (East-West, Northwest-Southeast, North-South, Northeast-Southwest, East-West, Southeast-Northwest, South-North, Southwest-Northeast). This option refers to the direction of the letters in the word. For beginners, and younger students the Est-West direction is recommended. The arrows on the screen show which directions are selected in the SETTINGS for the current word search. – Maximum Number of Words to Find (1, 2, 3, 4, 5, 6, 7, 8, 9, 10). This option refers to the number of words you would like your student to search in the Word Search. 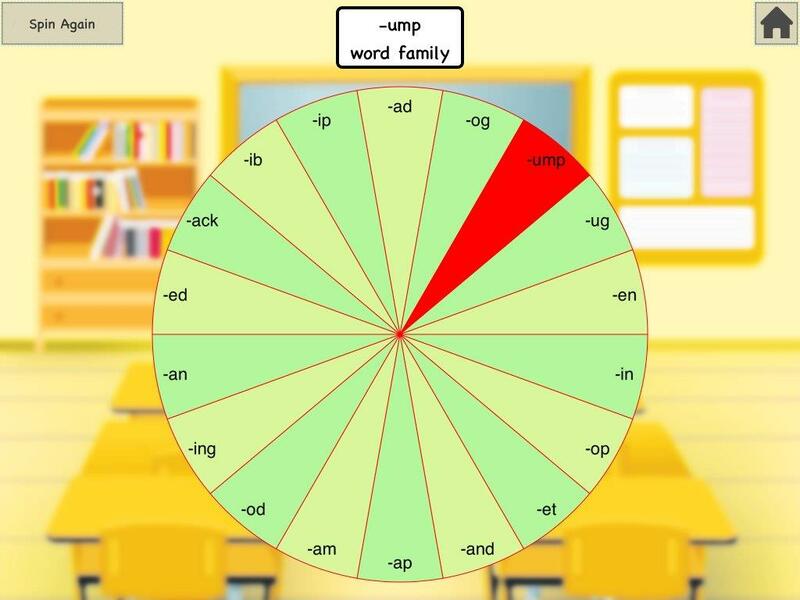 e) Word Families follow-up activity is designed as a fun roulette with word families written on it instead of numbers. The roulette spins and stops on a random word family. Students are asked to think about and say out loud/ or write down any words from the word family that is shown. When the students have completely mastered the concept and spelling in controlled exercises, they can move on to the (free) production phase. 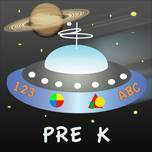 In this phase, they use the newly learnt language concept to produce oral or written texts. 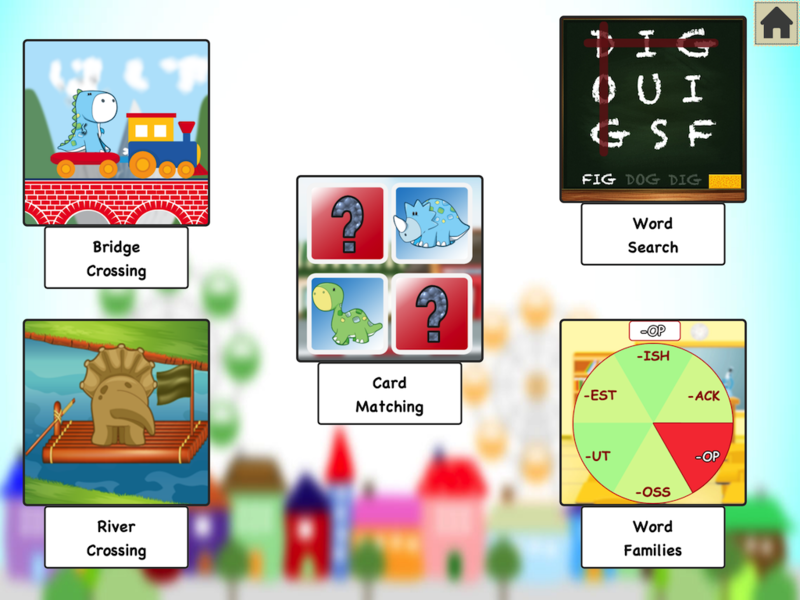 The follow-up activity Word Families could be used to lead the students into a less controlled activity. Production activities may include dialogues, oral presentations, and the production of sentences, paragraphs or longer texts. The teacher is not expected to intervene or correct in this phase. If mistakes are made, they are pointed out after the exercise has finished. 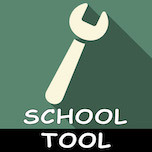 School Tool Rhyming Words did not include Production Phase of PPP in the design of the app. 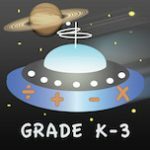 It is left to the teachers/caregivers to involve students in using their rhyming-words knowledge by writing a simple narrative using some of the words from the app and showing they have mastered spelling. Students may be asked to invent a short poem (rhyming text). Both teachers and parents have a need to see students’ progress report presented to them after a while. 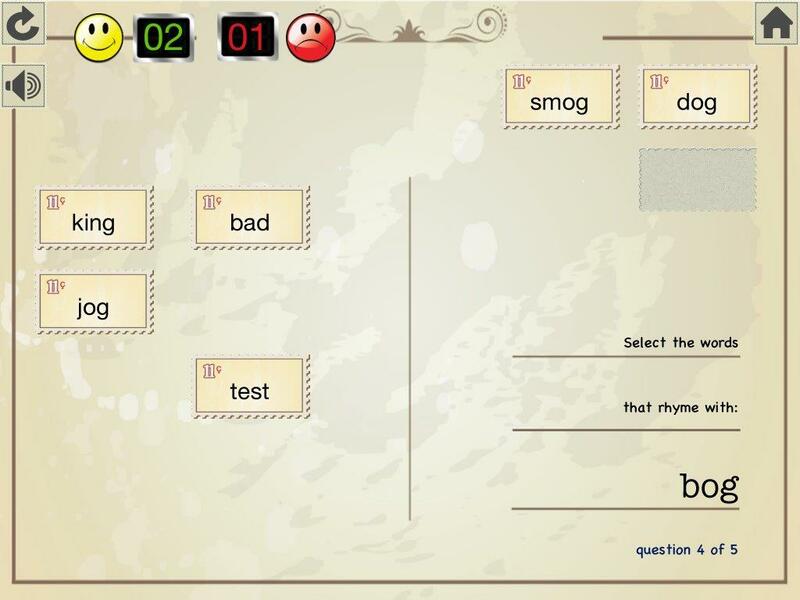 Thus, Quiz mode is designed to focus on testing students’ accuracy providing them with a quiz score. Students’ progress report can be tracked in HISTORY section of the app. The report tracks progress of individual students. In SETTINGS, you may choose the number of questions you wish the students to answer. To do this go to SETTINGS, then Word Settings, then Number of Questions in Quiz, and then tap next to the desired number. 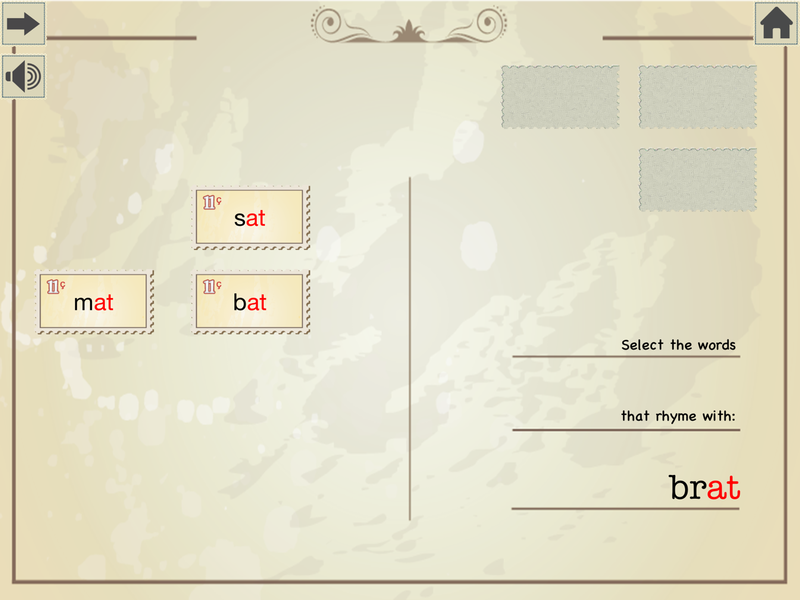 You can choose which rhyming chunks you wish the students to do in Quiz. You can choose one or multiple rhyming chunks in SETTINGS (go to Word Settings, then Tap to select active word classes, then tap next to the desired rhyming letter cluster). To make the rhyming chunk obvious to students switch color-coded letters option to ON in SETTINGS. If the students are beginners or struggling with this concept, you may choose the number of rhyming words to choose from (1 through 4) in SETTINGS. Also, you have the option to choose the number of redundant non-rhyming words added as a distraction (0 through 4).